Now that rehearsals for The Barber of Seville are officially underway, we’ve been able to catch up with some of our fantastic singers, and we’ll be bringing you Q&As with them over the next several weeks. 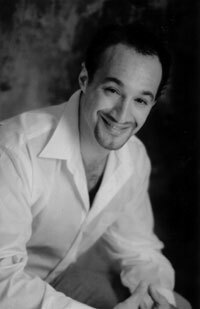 First up is our opening night Figaro, José Carbó, who happens to be making his U.S. debut in Seattle, as well. We talked to him about his character, his Argentina-meets-Australia background, and what career he originally wanted. José, can tell you us a little about your background? I’ve heard that you grew up in Australia but were born in Argentina. I was born in Argentina and lived my first five years there. The reason my family immigrated to Australia was the state of the Argentine economy at the time. Dad was working two jobs per day (that's 16 hours a day, plus travel) and Mum was working part time, and we still could not scrape through to the end of each month without asking favors of our family and friends. Luckily, Australia was looking for skilled construction workers at the time, so Dad decided to apply and was accepted. The reason I maintain fluency in Spanish is that my parents sent me to Spanish school every Saturday until I was 14. More importantly, though, they insisted we speak Spanish at home—something I am trying my hardest to emulate with my 9-year-old son Zach, but with variable success. Do you identify strongly with your Argentinean roots? Even though I grew up in Australia, the blood that runs through my veins remains Latino. My love of tango was instilled by my grandfather who would play his bandoneón for my brother and me on request. There was always tango playing on the radio in those first five years while Grandma (a seamstress) and Grandpa (a tailor) would cut and stitch the days away as my brother and I tried our best to destroy the home. José Carbó as Enrico in Opera Australia's 2008 production of Lucia di Lammermoor. Did you always want to be an opera singer? I did all of my schooling in Australia and left school with what I remember as a very clear ambition to become a highly-skilled furniture-making master. I developed a love of crafting timber with my hands through our woodworking classes in secondary school and hoped I could one day make a living from this love. But I left school and realized that the advent of industrial super-efficiency marked the end of any aspirations of trying to make a living by producing one or maybe two pieces of refined furniture per week. Machines could produce hundreds per day! So, the next best thing was carpentry and the building industry. I completed my apprenticeship and became a carpenter and immediately began to work for several builders while studying three nights a week for three years to obtain my builder's license. Once the builder's license was achieved I began working for myself as a carpenter/builder and began building up a small building company which I ran for 10 years before opera took over. Now that you’re in Seattle, one of your castmates is tenor Lawrence Brownlee, who will be performing the role of Almaviva. You’ve two have performed these roles together before, haven’t you? Yes, at the Teatro Real in Madrid, in 2005. We had a great time together and became good friends. It's like old times being in the same cast again. We went out for sushi after a rehearsal last week to catch up. I imagine that camaraderie between cast members is important in comedies. Camaraderie in comedy is paramount because it translates onto the stage. It's all about giving each other enough space to do what we do best without being selfish and needing to hog the limelight. Comedy will always work better when both artists are firing. The greatest thing about doing this role again with Larry is that we get a chance to refine our chemistry and to delve a little deeper into our respective roles. 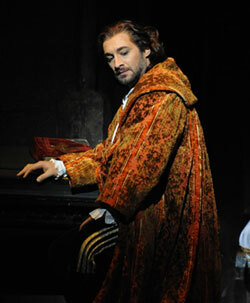 José Carbó as Figaro in Le nozze di Figaro at Rome's Teatro dell'Opera in 2005. This production of Barber marks your U.S. debut. How does that feel to be performing here for the first time? This is a double debut for me: first time singing in both the States and also my first visit to Seattle, this beautiful city. I am a bit of a coffee nut so I look forward to sampling your best coffee institutions while I'm here. And spending time with my family who arrive in a couple of weeks will be heaven! You’ve had a very active career in Australia, but what about Europe—where have you had the opportunity to sing there? At the Teatro dell' Opera in Rome, the Swiss Symphony, the Teatro Real in Madrid, the Mozart Festival in La Coruña, Spain, and at La Scala in Milan. 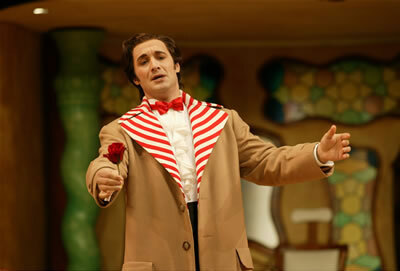 Now, about Barber and your character: How is Figaro different than some of the other characters you’ve performed? Is this a character your particularly enjoy, and if so, what do you like about him? He is different in the way that he is a title role rascal. This is very different to the way a standard rascal (for example, Lescaut in Manon Lescaut) is set in that it allows great comic and interpretational latitude. The standard rascal tends to be more constrained and therefore a slave to the story. Figaro, on the other hand, is expected to be the manipulator of the plot. This bestows a far greater responsibility of stage presence and command of character. I adore the role because it gives me a chance to play a very accomplished personality. Figaro is the quintessential Jack of all trades. To become such a person one needs an enormous amount of life experience, wit, intelligence, and intuition—but most of all, optimism and enough courage to take life-changing risks. What makes him so attractive is the confidence he exudes as a man who has hit rock bottom on more than one occasion. You always sense that, no matter what situation he gets himself into, his knowledge and guile will always be more than enough to pull him through. Figaro spends the entire opera helping to play matchmaker for someone else. Why do you think he doesn’t have a love interest himself in Barber, particularly considering how highly he thinks of himself? Beaumarchais is the person responsible for this. He has saved Figaro's love interest for his next play, Le nozze di Figaro. There is already enough going on in the story of the Barber. To add any more content to this masterpiece would have ruined its impact and flow.